ALGIERS (Reuters) - Libya's warring factions are very close to a deal on forming a unity government and could sign a long-awaited accord in a month, the new U.N. envoy said. "We are very close to a deal even if some hurdles remain. I believe we can sign in a month. Talks have lasted for a year and it is time now to sign a deal," U.N. envoy Martin Kobler told Reuters by telephone late on Tuesday during talks in Algiers. "The government of unity should be based in Tripoli." 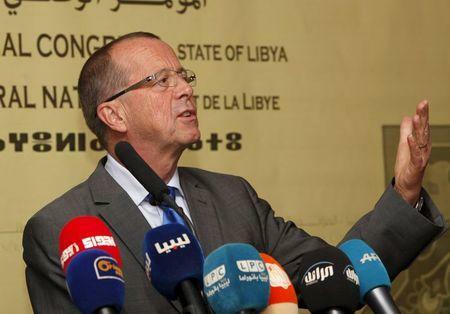 Kobler said there was no talk of sanctions against those resisting the deal for the moment, but rather efforts to "encourage Libyans to go for a solution". The U.N. proposal calls for an executive six-member presidential council that tries to represent Libya's traditional regional powerbases, along with the House of Representatives congress and a second advisory chamber State Council. Four years after the revolt against Muammar Gaddafi, former rebel brigades have turned on each, vying for power and control over the Opec producer's oil reserves. The internationally-recognized government and elected parliament have since operated out of the east, backed by a coalition of other armed factions, including one led by General Khalifa Haftar, once an ally of Gaddafi's.